Volvo Penta has been in the business of providing boating enjoyment for over a century. Our solutions are all aimed at maximizing good times – and minimizing distractions. For powerboats, we provide reliable engines and state-of-the-art propulsion solutions that ensure your time at sea is always spent in the right way: focusing on the here and now and enjoying the experience. At Volvo Penta, we believe that boating should be as enjoyable and relaxing as possible. We therefore use our experience and expertise to supply you with integrated, innovative, easy-to-use and fuel-efficient solutions that will make your boating experience even more enjoyable. It’s the smarter way to Easy Boating. 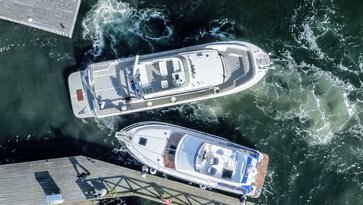 At Volvo Penta everything is designed, developed and manufactured together – from engines to transmissions, drives and propellers. Everything can be easily controlled and monitored with the intuitive Electronic Vessel Control (EVC) system. With the system, you can plot a route on the Glass Cockpit System, activate the Autopilot on your Joystick, and be guided smoothly to your destination. Easy and intuitive. Backwards and sideways docking. Forward at full speed. Stability in rough conditions. Wherever you’re going, the Joystick gives you precision at your fingertips with its unique functions – Joystick Driving and Joystick Docking.